Terrain: Very low lying and narrow coral atolls. Climate: Tropical; moderated by easterly trade winds (March-November); westerly gales and heavy rain (November-March). Nationality: Noun — Tuvaluan (s); adjective — Tuvaluan. Population (2011 est. ): 10,544. Age structure (2011 est.) — 30.6% under 15; 5.4% over 65. Population growth rate (2011 est. ): 0.702%. Ethnic groups: Polynesians 96%, Micronesians 4%. Religion: Church of Tuvalu (Congregationalist) 97%; Seventh-day Adventist 1.4%, Baha'i 1%, other 0.6%. 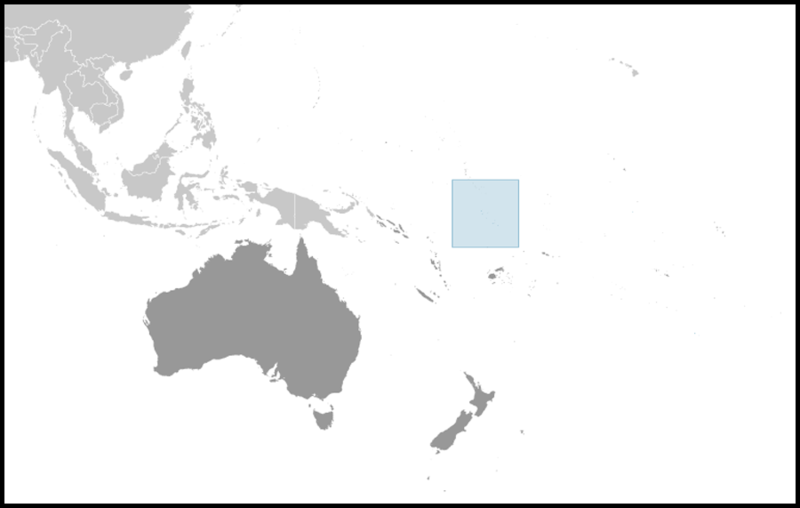 Languages: Tuvaluan, English, Samoan, Kiribati (on the island of Nui) also spoken. Health (2011): Life expectancy: total 64.75 years; male 62.7 years; female 66.9 years. Infant mortality rate (2011 est.) — 34.52/1,000. Work force: About one-quarter of the work force participates in the formal wage economy, and about 40% of the formal work force is employed in the public sector. Type: Constitutional monarchy with a parliamentary democracy. Independence (from U.K.): October 1, 1978. Branches: Executive: Queen Elizabeth II (head of state, represented by a governor general); prime minister (head of government). Legislative — unicameral Parliament, also called House of Assembly (15 seats; members elected by popular vote to serve 4-year term). Judicial — High Court with eight Island Courts (with limited jurisdiction). Rulings from High Court can be appealed to the Court of Appeal in Fiji. GDP (2010 est., purchasing power parity): $36 million. GDP per capita (2010 est., purchasing power parity): $3,400. GDP real growth rate (2010 est. ): 0.2%. Industry: Types: fishing, tourism (government and non-governmental organization officials on business), copra. Trade: Exports (2007 est. ): $100,410; stamps, copra, handicrafts. Major markets — Fiji, Australia, New Zealand. Imports (2007 est.) — $15.5 million; prepared foodstuffs, mineral products, machinery, animals and animal products. Major sources — Australia, Fiji, Singapore, New Zealand. The Western Pacific nation of Tuvalu, formerly known as the Ellice Islands, is situated 4,000 kilometer (2,486 mi.) northeast of Australia. It is half-way from Hawaii to Australia. Tuvalu consists of four reef islands and five true atolls, with poor soil and a total land area of only about 26 sq. km. (10 sq. mi.). Tuvalu has westerly gales and heavy rain from November to March and tropical temperatures moderated by easterly winds from March-November. The land is very low lying with narrow coral atolls. The highest elevation is five meters above sea level. 96% of Tuvaluans are ethnic Polynesians, closely related to the people of Samoa and Tonga. The vast majority belong to the Church of Tuvalu, a Protestant denomination. Conversion began in the 1860s with the arrival of a Congregationalist missionary from the Cook Islands. Eventually, the islands came under British influence in the late 19th century. The Ellice Islands were administered by Britain as part of a protectorate (1892-1916) and later as part of the Gilbert and Ellice Islands colony (1916-74). During World War II, several thousand American troops were in the islands. 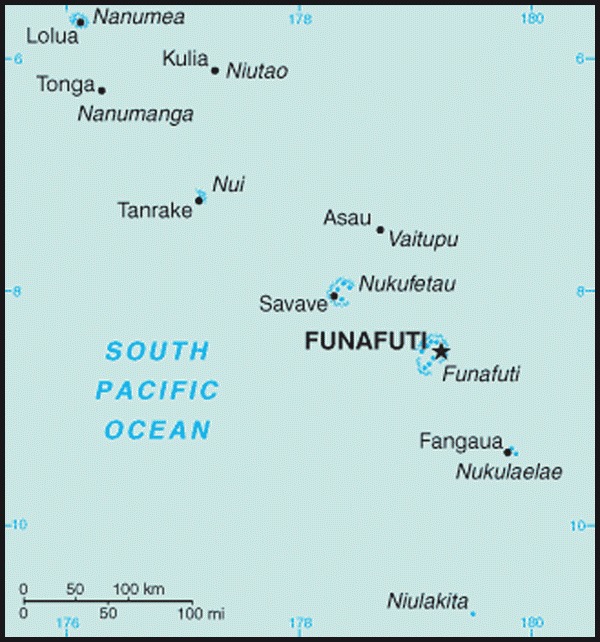 Beginning in October 1942, U.S. forces built airbases on the islands of Funafuti, Nanumea, and Nukufetau. Friendly cooperation was the hallmark of relations between the local people and the troops, mainly U.S. Marines and U.S. Navy SeaBees. The airstrip in the capital of Funafuti, originally built by the U.S. during the war, is still in use, as is the "American Passage" that was blasted through Nanumea's reef by SeaBees assisted by local divers. Queen Elizabeth II is the head of state, represented by the governor general, who is appointed by the Queen on advice of the prime minister. Members of the Parliament elect the prime minister. The cabinet is appointed by the governor general on the advice of the prime minister. The legislative branch is a unicameral Parliament, also called House of Assembly (15 seats; members elected by popular vote to serve 4-year terms). Tuvalu maintains an independent judiciary consisting of a High Court and eight island courts. The rulings of the High Court can be appealed to the Tuvalu Court of Appeal. Tuvalu maintains a diplomatic mission in New York at 800 2nd Ave, Suite 400B New York, New York 10017 (tel: 212-490-0534; fax: 212-937-0692). Democratic values in Tuvalu are strong, with free elections every 4 years by universal adult suffrage. There are no formal political parties; election campaigns are largely on the basis of home island/personal/family ties and reputation. Members of Parliament have very close ties to the islands they represent. Often the northern islands in the country compete against the southern islands, with the capital isle of Funafuti holding the balance of power. Traditional chiefs and island councils also still play significant roles in influencing island affairs, particularly on the outer islands. A long-held distinction between chiefs and commoners is slowly disappearing, and chiefs are now more often selected on merit rather than by birth. Tuvalu has had a number of prime ministers. This in part reflects the pressures affecting the small nation, including the transition from an exchange economy to a money economy, an adopted system of government with only limited regard for Tuvaluan traditions of decision making, and the lack of a clear national path to implement Tuvalu's vision for the future. After elections in September 2010, Maatia Toafa became Prime Minister, replacing Apisai Ielemia. Toafa previously was leader of the opposition; he also had been prime minister from 2004 to 2006. In December 2010, after a vote of no confidence, Toafa was replaced by Willy Telavi, the Minister of Home Affairs. Telavi is the 13th Prime Minister of Tuvalu. The next elections will be held in 2014. The economy suffers from Tuvalu's remoteness and lack of natural resources. Virtually the only jobs in the islands that pay a steady wage or salary are with the government, and nearly 39% of the formal work force is employed in the public sector. Subsistence farming and fishing remain the primary economic activities, particularly away from the capital island of Funafuti. There is relatively little disparity between rich and poor in the country. 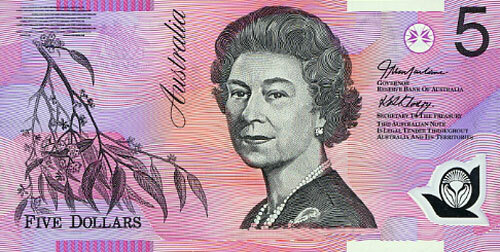 The Australian dollar (A$) is the currency of Tuvalu. Tuvalu's GDP per capita was about U.S. $3,400 in 2010. Only about one-quarter of the labor force participates in the formal wage economy. The remaining 75% work primarily in rural subsistence and livelihood activities. There is growing youth unemployment and few new jobs are being created. The Tuvalu Trust Fund (TTF), a prudently managed overseas investment fund, has contributed roughly 11% of the annual government budget each year since 1990. The TTF was created from donations by Australia, New Zealand, and the United Kingdom (along with Tuvalu's own contribution) at independence. The TTF has grown from about A$27 million to some A$100 million (est. 2008). Earnings from the TTF provide an important cushion against Tuvalu's volatile income from fishing license fees and royalties from the sale of the dot-TV Internet domain. Initial windfall income from the domain name paid most of the costs of paving the streets of Funafuti and installing street lighting in mid-2002. Sales of national stamps and coins provide another minor source of income for the government. Tuvalu is a safe country of unspoiled natural beauty and friendly people, but remoteness and lack of infrastructure have constricted Tuvalu's ability to develop its tourism potential. Tuvalu maintains an independent but generally pro-Western foreign policy. It maintains close relations with Fiji, New Zealand, and Australia. It has diplomatic relations with Taiwan, which maintains the only resident embassy in Tuvalu and has a large assistance program in the islands. There is no U.S. embassy in Tuvalu, but U.S. diplomats from the U.S. embassy in Fiji are accredited to Tuvalu and visit there regularly. Tuvalu became a member of United Nations in 2000 and maintains a mission at the UN in New York. Tuvalu's only other diplomatic office is its High Commission in Suva, Fiji. Tuvalu is an active member of the Pacific Islands Forum and a member of the Asian Development Bank, the International Monetary Fund, and the World Bank. The U.S. Embassy (http://suva.usembassy.gov/) in Fiji, also accredited to Tuvalu, is located at 158 Princes Rd, Suva. Tel: 679-331-4466. Fax: 679-330-2267. The mailing address is U.S. Embassy, P.O. Box 218, Suva, Fiji.